This restaurant is located in downtown Toronto, I’ve gone past this restaurant many times and missed many opportunities to try it out. I’m not sure about it’s other meals but HW and I have been trying to target this place for it’s buffet. Located on Gerard just off of Bay street this restaurant has that fairly typical unassuming exterior. The price for this buffet was $9.95. I wasn’t expecting too much as most of the Indian buffets here in Vancouver either are severly limited or aren’t very good at all. I was surprised to find a very extensive salad bar along with a full array of various North Indian style dishes. The majority of buffets here locally tend to be only vegetarian at this price or if they include any meat it is very limited. 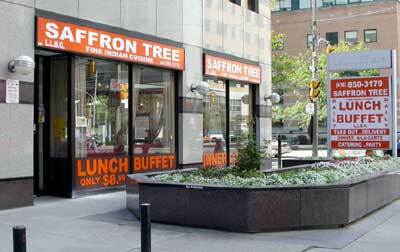 With Saffron Tree, not only was there meat dishes but there were a variety. They had the typical butter and tandoori chicken as well as a lamp dish and various other curries and masalas. The service was exceptional for being a buffet. Naan bread was served at the table hot from the oven and there was a constant supply of water. To top it all off there was also a dessert section with traditional Indian desserts as well as a freezer full of tubs of ice cream. Definitely worth the price if you’ve got an appetite.